Place panko in a large bowl with milk, let the panko soak up the milk, once this happens add the rest of your ingredients and mix by HAND until mixed well. Form into balls, the size is up to you. We like ours about a 2 inch diameter, now place meatballs on a parchment lined baking pan with sides and bake at 450' for 30 minutes or until completely done and no longer appear pink in the middle. I always cut one and check when the 30 minutes are up. 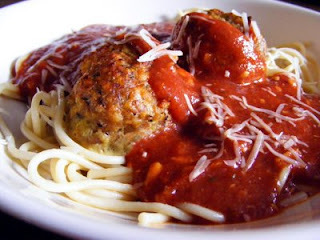 Serve with Paul Newman's Sockarooni Pasta Sauce and spaghetti. That is What's Cookin on Beaty's Creek tonight.